You may wonder what the title of this post is about, well it is my recap of LSCon day 1. I took one word from the title of all the sessions I attended and this is the result. It makes up an interesting sentence and it is in that way a good recap of the first day, an interesting day. It looks like that change is reaching the inhabitants of the world of learning. And they took their first sniff at agile. What is your business really about? For more check his presentation, you can download it from his website. Interesting reading and he is an entertaining presenter. Next was a presentation from Marty Rosenheck. He jumped the 70:20:10 bandwagon. Core message the formal learning (10) is served by the LMS what do you do with the 90%? He is really big on apprenticeships and has a nice vision of that (learning in the real world without the bog claim on experienced people so you can make it scalable). He has created a solution (Trek) based on TinCan that supports this kind of learning. I attended the serious elearning manifesto session. As expected it was a recap of the launch from last week. I really do support this initiative and I do thing that we should do a better job. At the ame time you hear more and more critical sounds: that the initiative brings nothing new to the table. They made it very clear that their goal is the raise the general level of eLearning in order to make it more effective, it is not about innovation, but about applying the stuff we already know (or should know). 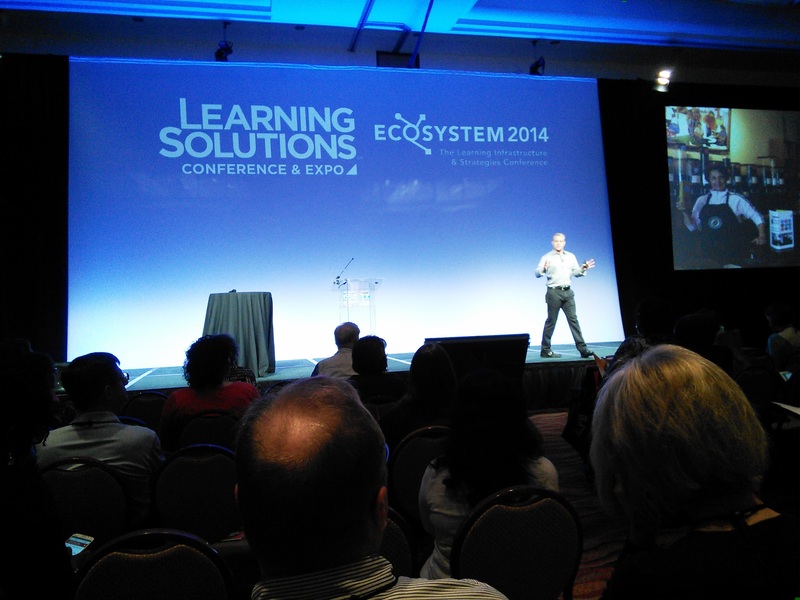 This year there is a second conference next to Learning solutions: Ecosystems 2014. It is more on a strategic level. You have to have a special upgrade in order to attend the sessions, build the guild was kind enough to allow me to party crash a session. The session I attended was about ecosystems and was presented by Lance Dublin. For him the term ecosystem was also new, so he took us on a journey to discover it with him. I got from it that an ecosystem is a living and ever changing thing that enables and facilitates learning. It should contain four elements: Process, people, Technology and content. So it is not an architecture (that is part of the ecosystem) but the whole thing. The reason we have to thing about this is the increasing speed of things, our old ways (LMS learning with courses) do not work anymore. We need something that delivers Performance at the speed of need. He gave s an impressive list of opportunities/changes, developments that should be part of an ecosystem: Mobile, Moocs, Cloud, social learning, serious games, Big data, personalization and much more. He also defined the goal of an ecosystem: Performance. He promised to share his presentation, but is is not available now. I will share it with you when I can. This was a really nice session although it didn’t bring me what I expected from it. It was presented by Megane Torrance. I did expect her to make the connection between agile and lean. I do know about agile, I wrote a whole bunch of post on it. I know a bit about lean and was curious about the connection. Instead she took us through the eight wastes of lean (Transport, Over-processing, Time & Intelligence, Motion, Waiting, Overproduction, Inventory, Defects) and she challenged us to come up with waste on these topics and solutions for them. Based on the info she gathered she will create an article for the learning solutions magazine. So we sort of crowd sourced an article in an hour. Really inventive and informing. So this leads up to the conclusion of day 1. As I wrote in the beginning of this post. I have the feeling that change is reaching eLearning. But I see only the first signs of it. People are aware that they need to change and that raises more interest in topics like TinCan, Agile, innovation. But most of them are just investigating, it will take a while before they can act on it.